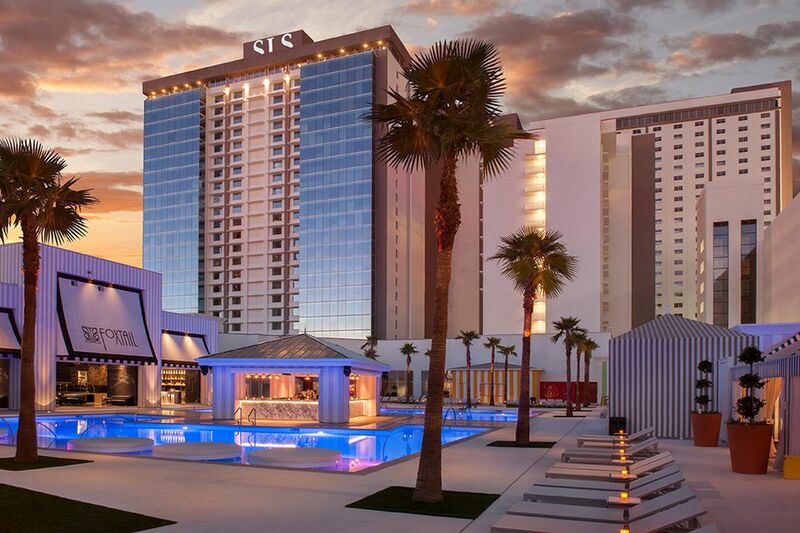 The Sahara hotel has been replaced by the SLS Hotel on the north end of the Las Vegas strip. Gone is the roller coaster fronting Las Vegas Blvd and it has been replaced by a hip, chic resort that caters to a bit more of an upscale party crowd. You will see some remnants of the old Sahara hotel inside the newly refurbished property in the form of photographs and hotel towers. The rooms at SLS Las Vegas have been completely renovated by the floor plans are still the same. If you seek out a little nostalgia it will be hard to find at the new SLS Las Vegas. The casino and front of the hotel are unrecognizable as the old Sahara hotel so those memories will only live on in your mind and the photographs that can be found around the property. The spot where the NASCAR Cafe once stood is now an open-air bar with a great view of the Las Vegas strip. New restaurants SLS Las Vegas include Umami Burger, Bazaar Meat by Jose Andreas, 800 Degrees Pizza and Cleo. What it’s like at the NASCAR Café Las Vegas? If you enjoy NASCAR you should be pleased with this place. If you don’t, it’s like eating in a car dealership that has been transformed into a garage with way too many lights. The memorabilia is fun to look at and the atmosphere is very friendly. For a themed restaurant, it ranks right up there with the Rainforest Cafe and Planet Hollywood. Everyone seems into the idea of a racing-themed menu. How’s the food at the NASCAR Café Las Vegas? You cannot mess up burgers and pizza so for the price, you get a decent meal where the entire family can sit around and be loud. The bar area is actually a good place to watch some sports and it gets a little loud during sporting events.